Proposals for a surface mine on the Northumberland coast are no less polarising now that councillors have given the scheme their go-ahead. There were cries of ‘shame’ as well as applause in a packed and passionate council chamber at County Hall in Morpeth as the Highthorn application was approved on Tuesday. Northumberland County Council’s strategic planning committee met to decide if Banks Mining’s proposed surface mine, on land south-east of Widdrington, should get the go-ahead. And councillors voted to follow the planning officers’ recommendation and approve the seven-year scheme, for a 325-hectare site between Druridge Bay and Widdrington Station, by 13 to none with one abstention – local ward member, Coun Scott Dickinson. However, the members are ‘minded to approve’ the scheme as a request has been made for the Secretary of State to ‘call in’ the application, which could lead to a public inquiry and a final decision by a planning inspector. Ever since the proposals were unveiled three years ago, in July 2013, there have been plenty of strong emotions on both sides of the debate and this was in evidence before, during and after Tuesday’s meeting. Concerns from objectors include the impact on climate change, potential damage to tourism, the impact on wildlife and ecology, road issues and negative effects on residential amenity, including noise, dust and air pollution. But on the other side, the company and its supporters point to jobs and economic benefits, as well as the plans for restoring the site following the five years of extraction of coal, sandstone and fireclay. After about two hours of debate, Coun Jeff Gobin moved approval, saying: “I’m not prepared to sit here and put young people on the dole. 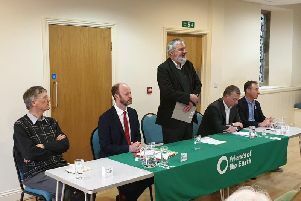 Coun Andrew Tebbutt also agreed with Coun Gobin about providing jobs, but also warned about losing an appeal due to the lack of any objections from the statutory consultees, such as Natural England and county highways. Also referring to the risk of appeal, Coun Ian Swithenbank pointed out that approval means the council has control over the planning conditions, rather than the application being handed over to an inspector who has never been to the area. A number of members also mentioned that they believed Banks to be a good company and employer and one which would be true to its word on the restoration and other benefits which will come on the back of this venture. On this note, the committee chairman, Coun Paul Kelly, reminded those present that ‘the ponds and pools in the Druridge Bay area are the heritage of mining’. He added that it was ironic that this mine won’t affect the landscape as much as ‘green’ windfarms. Earlier in the meeting, as with all planning committees, there was a five-minute slot each available for objectors, supporters and local council representatives. Jeannie Kielty, from The Banks Group, was joined by two of the firm’s employees, who pleaded the case for keeping their jobs. However, objector Jonathan Rodger, from the Save Druridge campaign, said that ‘socioeconomic deprivation and opencast mining go hand in hand’, while also describing opencasting as ‘mankind’s most destructive peacetime operation’.